Movie Ramble: Waltz with Bashir. Which brings us nicely to the animated documentary Waltz with Bashir (2008). It tells the story of the Sabra and Shatila massacre which was carried out between 16 and 18 September 1982 by the Lebanese Forces militia after the Israeli Defense Forces (IDF) allowed Lebanese Christian Phalangist militiamen to enter two Palestinian refugee camps where they brutily massacred the civilians. It was argued that the Israelis should have known that the massacre would occur, considering the recent assassination of Phalangist leader and prospective president Bashir Gemayel and given the long history of animosity between the Palestinians and the Phalangists. The exact number killed is disputed, but ranges between 328 and 3,500. Although this is a very sound piece of film making it’s not a particularly a easy watch. 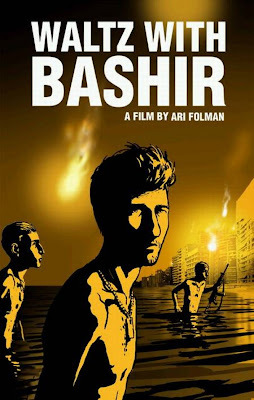 This movie bares a remarkable resemblance to the current troubles in Gaza but the animation seems to dilute the seriousness of the subject until you’re forced to sit up and take notice when the live segment at the end of the film graphically demonstrates the true extent of the massacre!